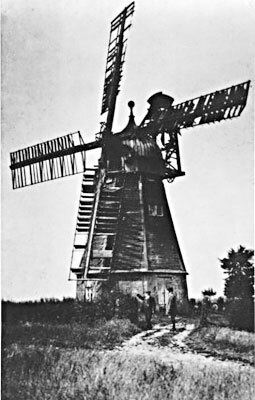 Welney Mill Farm smockmill stood to the north of the village on the west side of the March Road at Mill Farm. The four storey six sided mill was built over a brick base with sloping sides. The ogee cap with its ball finial was vertically boarded to form a petticoat and held an eight bladed fan. The four double shuttered sails turned clockwise, one pair had 7 bays of 3 shutters and the other pair had 6 bays of 3 shutters and 1 bay of 2 shutters and they powered 2 pairs of stones. In the 1800s Welney was in Cambridgeshire. A MESSUAGE or FARM HOUSE with the Barn and outbuildings belonging and also a good WIND CORN MILL near, adjoining the Two Closes of Pasture land and 3 pieces of Arable Land, all lying together and abutting upon the land of Robert Beart north, upon the road leading from Welney to March east and upon lands of the said R. Beart and of Mr. Wm. Golding west, now in the occupation of Mr. Samuel Dalton and containing in the whole 40a. 0r. 25p. N.B. 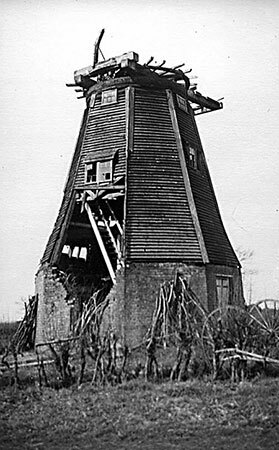 The Wind Corn Mill drives two pairs of stones and was lately extensively repaired by the former owner. Possession will be given at Michaelmas 1870. All that MESSUAGE or FARM HOUSE with the Barn and Outbuildings thereto belonging and also a good WIND CORN MILL near adjoining with two Closes of PASTURE LAND and three pieces of ARABLE LAND containing altogether 40a. 0r. 25p. all lying compactly together and now in the occupation of Mr. Samuel Dalton; Also a piece of ARABLE LAND situated in Welney aforesaid containing 10a. 3r. 3p., also in the occupation of the said Samuel Dalton. The above Estate is close to the village of Welney and adjoins the highway Road leading from Welney to March. The Wind Corn Mill drives two pairs of Stones, has lately been extensively repaired and has a good business connection.